The time was 815am (not going to be late this time round) when I rolled into the Venus Carpark of MacRitchie Reservoir. It was clearly a sight of unfamiliar faces – various families getting hyped and all ready for the TreeTop Walk(TTW), a small congregation having picnic on the grassland BUT no TCRP. There I was standing under the tree averting the sun rays when I so happened to hear Ting's name being mentioned. Ahhh. Alas, these two unknown beings (Nina and Aziz) must be fellow catalysts too! Soon after, Jasmine, Angel, Shei Wah (who brought along his two lovely offspring – Isabella and Irving) arrived. Attendance checked and we were all ready to begin the hike through the stages of the mature secondary forest. An hour through the condensed trail, we reached our destination . The 250 meters, approximately 25 meters high free-standing suspension bridge that connects the two highest points (Bukit Pierce and Bukit Kalang) of MacRitchie Reservoir. “One-Way. No Turning Back,” was the sign indicated right before we trundled onto the lumber planks. 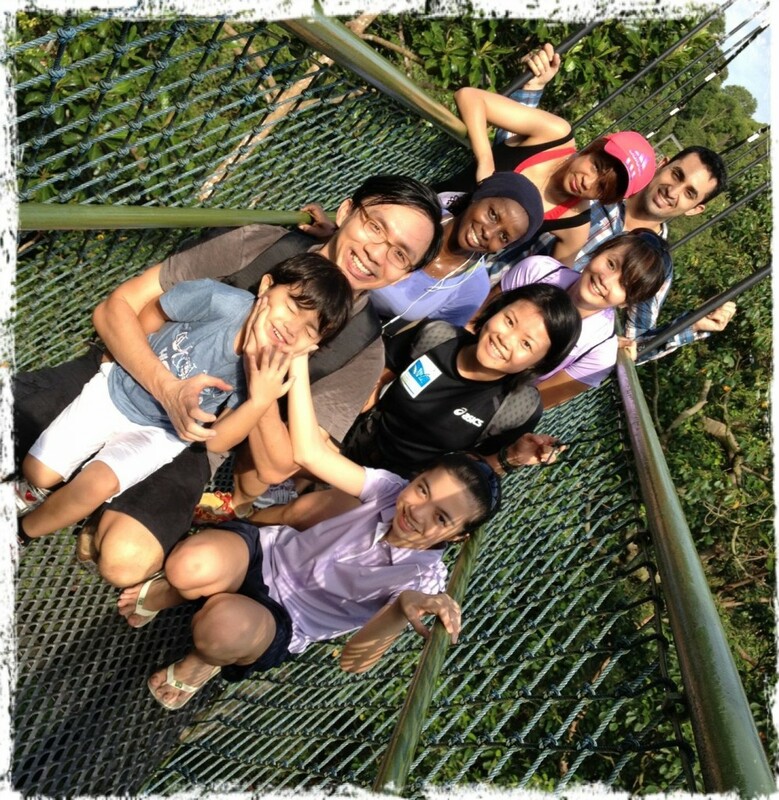 Now, even the TreeTop Walk was psyching our minds to prep ourselves for the challengers looming ahead in Davao! Definitely a statement to keep. Peace, calm, serenity along with bird's eye view of the lush forest below, we enjoyed every foot that we set upon on the TTW. We went on a couple more trails and out we were, back to the Venus Carpark of MacRitchie Reservior.